her knees, weeping till her hair was wet. arrived, no one sent a card. I heard Moniza Alvi read at Exeter Poetry Festival earlier this month. How have I lived without her poems before now? 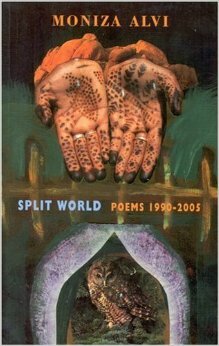 On that evening, I wasn’t sure if I was mishearing some of the words at the ends of the poems so I bought Split World Poems 1990 – 2005 and was immediately captivated. Such a lovely, unassuming person writing about things that might seem mundane but in her quiet, relaxed voice become utterly extraordinary. No wonder I thought I had misheard! Here’s the opening of The Laughing Moon from her 1996 collection called A Bowl of Warm Air. Two cheeks and one was England. Pakistan held me and dropped me in the night. Moniza Alvi left Pakistan for England when she was young and this led her to explore her own sense of duality. In later books she writes she ‘became interested in the interplay between inner and outer worlds, imagination and reality, physical and spiritual.’ I’d say she is very courageous and doesn’t shy away from the worst that humans inflict upon one another, getting deep under the skin of experience. I recommend anything by Moniza Alvi for her fine judgement and precision, for her ease and naturalness. Split World is great as it contains five of her collections. I wish I had also bought Europa. at night, a mesh covers the grimy window. to gasp. It settles back like things she’s heard said. She pokes feathers she’s found into cracks between planks. and gold as pheasants. There’s nowhere else. exactly as it was. She can’t answer what she can’t hear. All that summer the dust leaks must. they clink, like small beads.